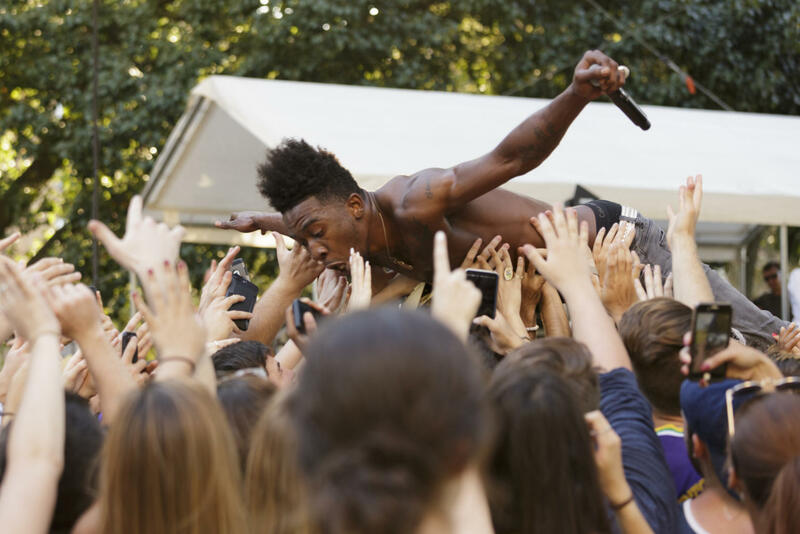 Then 20-year-old rapper Desiigner crowd surfed during his concert at Pitt Program Council’s annual Fall Fest in September 2017. With the recent heat wave hitting Pittsburgh, it’s hard to believe summer is coming to an end, but Pitt Program Council is here to remind you that fall is still coming. Fall Fest, Pitt’s annual music and arts festival, will be Sunday, Sept. 23, on Bigelow Boulevard. Last year’s celebration was definitely a hit. Hundreds of students made it out to Bigelow to watch exhilarating performances from hip-hop artists like Desiigner and Amine. This year will feature a different genre — indie rock. According to Pitt Program Council special events director Farrell Healy, preparation for this event takes months. Fall Fest will have four acts, which is the usual number for the event — with Young the Giant performing as the highly anticipated headliner. ROZES, a pop singer and songwriter from Philadelphia, was initially supposed to open for Young the Giant, but recently pulled out due to a personal issue. The Cincinnati-based indie-pop group Public will take her place. The first performance spot at the festival will go to the winner of the fall 2018 Battle of the Bands. The victor will be decided next week at the competition, which will take place Wednesday at 8 p.m. in the WPU Assembly Room. According to Healy and the Pitt Program Council public relations director, junior political science and economics student Eva Lin Feindt, choosing the headliners for Fall Fest is one of the longest process involved with setting up the festival. They collaborate with the special events committee, the special events director, advisers and other University staff to find up-and-coming acts in the music industry. Indie-rock group Young the Giant is this year’s perfect fit. The band from Irvine, California, is known for the hit song “Cough Syrup,” a platinum single tackled on the TV show “Glee.” The group consists of five current members — Sameer Gadhia, Jacob Tilley, Eric Cannata, Payam Doostzadeh and Francois Comtois. With the festival only weeks away, the excitement is starting to set in for those involved in the planning of the event. Each year, students pack Bigelow Boulevard for this event without fail. Feindt described why the event has such a staying power — and why the excitement does not dwindle year after year. “I think that the general gist of Fall Fest is that every year it is a music and arts fest, but it’s not the same every year because we put on a different show and the vibe is always different based off of who’s coming,” she said. In addition to the musical performances, there will be a student organization activities fair and games area opposite the stage on Bigelow, and will feature tables set up by different student organizations where students can play carnival games, free to anyone with a valid Pitt student ID. Students can stay updated the day of the event on Twitter — by following Pitt Program Council at @wedopittevents. Members of the Pitt Program Council are not the only ones gearing up for the hysteria of all-day music and art on campus for free — those planning to attend are counting down the days as well. Sebastian Curtin, a senior communication major, shared his thoughts after reminiscing on the experiences he had with his friends as a junior.